We buy the ticket for the "speedboat" at a cost of 700 THB (just under € 20). It takes about 3 and a half hours to reach the destination as the boat stops several times to get off or pick up new passengers from different islands along the way. During the whole trip, we really suffered from seasickness due to the extreme speed at which the boat went despite the rough sea. It was a nightmare! Therefore, we strongly advise against traveling with the Tigerline Ferry company! Finally we arrive on the island, so tired by the trip that a taxi driver even offers us a free ride to the hostel with the "tuk tuk". We stay 2 nights at Koh Mook Hostel for THB 350 per night or € 9 with breakfast included. The hostel is not bad. Indeed it is very nice and clean, with great wifi. We have a female dorm with 6 beds, with fan and air conditioning. For breakfast, you can choose between scrambled eggs with bread, pancakes with banana, bread with butter and jam or hard-boiled eggs with orange juice. We have lunch in a restaurant with sea view "Perfect beach restaurant" 3 minutes far from our hostel and we eat rice with vegetables accompanied by a fresh mango juice, all for just under 3 €. Very kind staff. Definitely recommended! Ko Mook is located in the Andaman Sea in Southern Thailand. He is part of Ko Kradan and Ko Libong of the Mu Koh Libong Archipelago and of the Had Chao Mai National Park located in the province of Trang. It is a small island 4.5km long and 3.5km wide in width; therefore you can easily move on foot, by bike or scooter for the lazy ones. After having lunch we walk towards Charlie Beach, but once again we meet a very kind taxi driver who gives us a free ride. Unbelievable! We immediately notice the extreme kindness of the local people. The locals here live on fishing, rubber cultivation and coconut plantations. Most of the population is Muslim, while only a small part of it is Buddhist. Charlie beach is the perfect beach where to admire a beautiful sunset while sipping a cold beer. Then we have dinner with noodles and prawns at a restaurant near the hostel for about 70 THB - less than € 2 - and here we have a chat with a guy from California, Taylor. 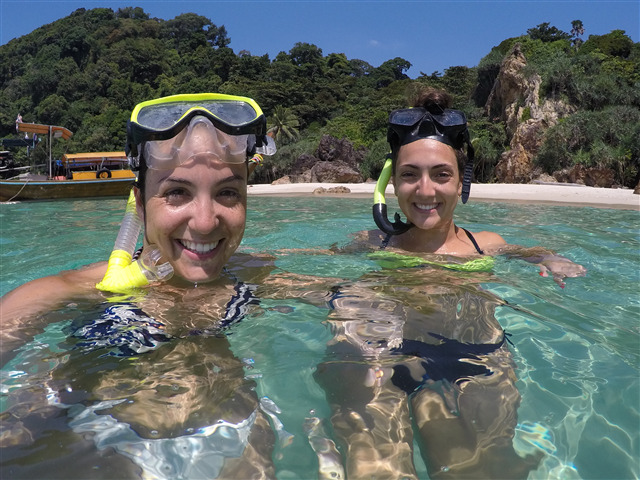 The next day we decide to buy a tour of the nearby island Koh Kradan, just half an hour by boat from Koh Mook. The tour includes a small private boat with a local captain who stops wherever we want. Not bad! We pay a total of 1500 THB, or about 40 euros in 2. We leave at 10.30 am and return at 4 pm. We visit not only Koh Kradan, but also the famous Emerald Cave of Koh Mook and the Sabai beach, very beautiful and not very touristy. The captain also provides us with a snorkeling mask and fresh water. We first stop on a spot of Mook island to do some snorkeling. We then proceed to the Sunset Beach on the island of Kradan. The latter fascinates us immediately for the wonderful color of sea and vegetation, as well as its crystal clear water. We take a walk inside the island and reach the Lost Paradise Resort. Going to the left you can see a very pretty but very breezy beach; while to the right, after about 15 minutes on a path in the forest, you can reach Ao Niang beach. It is a very long beach and excellent for snorkeling but it is also very windy therefore we decide to return to the beach where we first arrived. Here we do some snorkeling and enjoy this paradise. Around 2 pm we return to the island of Mook (or Muk which in Thai means pearl) to visit the Emerald cave, which is the main attraction of this island. We visit this cave together with our captain Yussain. As soon as we enter, we look at the sea bottom and we realize to be surrounded by lots of fish. We continue with Yussain who guides us with a torch and we swim for about ten minutes inside the cave completely in the dark until we reach the exit. We are facing a sort of a natural pool surrounded by thick vegetation. It is really incredible! But what makes everything even more surreal is the color of the water inside the cave that becomes almost phosphorescent with the entry of light: a blinding emerald green, from which the name of the cave derives. We return to the boat and we stop for the last stop on the beautiful Sibai beach. There is no one here and the color of the sea along with the wild vegetation is nothing short of spectacular! Once the boat tour ends, we stop at Sivalai beach. It is a sandy white beach and once again the color of the sea is just great! Here there are several resorts with bungalows directly on the sea, as in the case of the Sivalai Beach Resort. To conclude, we spent 2 very intense days and saw lovely beaches. These 2 islands are more popular from November to April as the remaining months are characterized by heavy rains. Although we are in high season, however, there are very few tourists. On the island, you can enjoy a familiar, relaxing and peaceful air. It is excellent for those who want a bit 'of relaxing outside the usual tourist routes but still enjoying beautiful beaches. In particular, Koh Kradan is more primitive and less developed. In fact, it offers few tourist facilities and you must book it in advance. Finally, both at Kradan and Mook there are no ATMs, so better to bring cash with you.